We are delighted to offer our members the opportunity to visit the site of the Bank Station Capacity Upgrade project courtesy of Dragados. Bank and Monument stations form the third busiest interchange on the London Underground network. Together they are used by more than 120 million passengers a year. That's an increase of 38 per cent since 2008. Improving the station is critical to keep London working and growing and is a key part of TfL's plans to increase frequency on the Northern line. 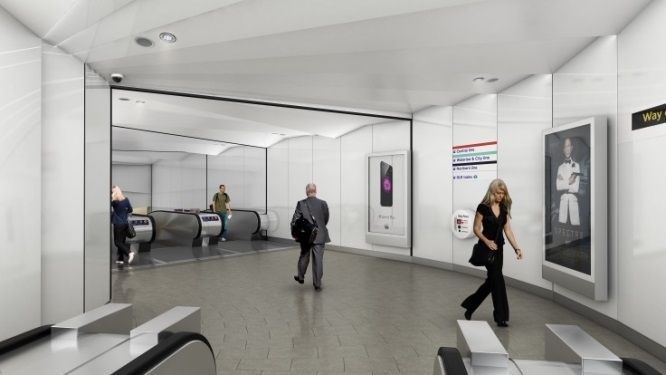 By 2022, the interlinked stations will feature several new escalators, a new station entrance and more room for Northern line passengers. This will increase capacity at the station by 40 per cent. Our visit will begin with a presentation from Dragados, giving an overview of the project and will be followed by a walking tour of the site. It is anticipated that the whole visit will take approximately two hours. To participate in the tour, full PPE will be required – hi vis jacket and trousers plus safety boots. It is possible that some PPE can be provided but priority will be given to those who can bring their own. If you require PPE could you please indicate your sizes on the registration form. There are only six places available and these are strictly for members only.. If the event is over-subscribed we will hold a ballot for places. We hope to see you there.This , please complete the form below. Do you have your own PPE as specified - high vis jacket, trousers, hard hat and safety boots? Thank you for adding your name to our waiting list. We will get back to you if a place become available.